The container vessel Tiger Spring went aground on a sandbar on the navigation channel on the Hooghly River. The vessel had been struck earlier by the motor vessel 12571 dwt Green Valley where the Hooghly and Rupnarayan rivers meet at Nurpur, India. The Tiger Spring was heading for Colombo after unloading containers at Kolkata. 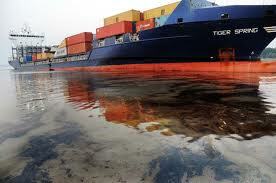 Reports state the vessel was hit amidship and that there was a release of pollution into the river. Reports state the Tiger Spring was released and taken to Diamond Harbour for repairs.